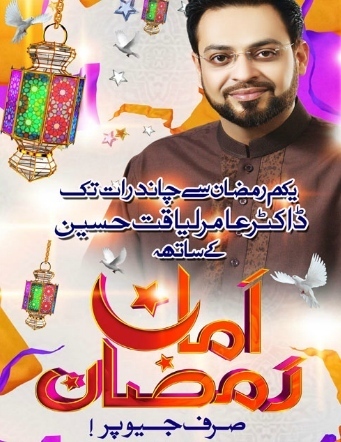 Inevitably one had to see what the slick self-styled Islamic televangelist Amir Liaquat was up to in his Geo Amaan Ramzan show. Looking dapper in a sherwani, must say his looks and gut are taut even to this day, he goes up to a kid, celebrating her roza khushai, first fast celebration, and asks if her mom made her clothes. The kid said her mother bought it for her. To which Sick Liaquat says with a patronizing tone of course, didn’t you wish your mother had stitched your clothes?!!! The show has already garnered controversy when in during an episode he played the role of Bilquis Edhi, the humanitarian’s wife who gives away babies for adoption, Prick Liaquat also gave away two babies for adoption. In another episode he invited an Internet singer sensation Tahir Shah and was reportedly obnoxious towards his guest. 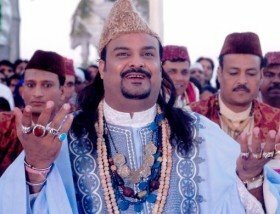 On Hum2 Amjad Sabri, who hails from the illustrious family of notable qawwals –the Sabris, tarnished the art when while doing his naqqara he invited youngsters to dance and one of the youngsters ended up doing a nagin naach (snake dance) to a qawwali and other little kids did their Bollywood thumkas. His father Ghulam Farid Sabri and his brother Maqbool Sabri, one of the topmost qawwals of their time, must have been turning in their graves when their scion did this blasphemous act. Abb Takk, the new entrant in a sea of TV channels, has pop singer now sufi artist Ali Haider, helming a show Ya Rehman Ya Rahim Ramazan. With a pleasant voice, handsome face, donning well-fitted gorgeous sherwanis on his ageless physique, Ali is a wholesome host asking interesting questions from the panel of ulema that come to his show. Blessed with a melodious voice he often sings a religious song along with an accompanying qawwal groups. He takes live calls from callers who are troubled with trivial religious questions and is giving away gifts for answering questions correctly in his show. JJ aka Junaid Jamshed and Waseem Badami host the Sehri transmission on ARY digital. The first part of the show is all about the self-styled Islamic scholar JJ, his thoughts and explanations about religious matters and as other Islamic scholars who in order to emphasize that they are truly Arabicised, pronouncing the ains in the Arabic fashion, JJ too utters words such as ashiq, arif, abid in an Arab manner except that it is unnecessary and sound pretentious. Not one to let go of his singing voice he regaled his mostly female audience with Naats and Hamds. Scholar sb in his sharaiee dadhee (shariat beard) and solid colored shallu kameez with the shallu also adhering to shariat along with Waseem Badami chat with a panel of Ulema about conceptual religious matters such as Ibadat and take audience’s questions who are more concerned about practical matters for instance what part of namaz to say if one has had an accident and the likes.